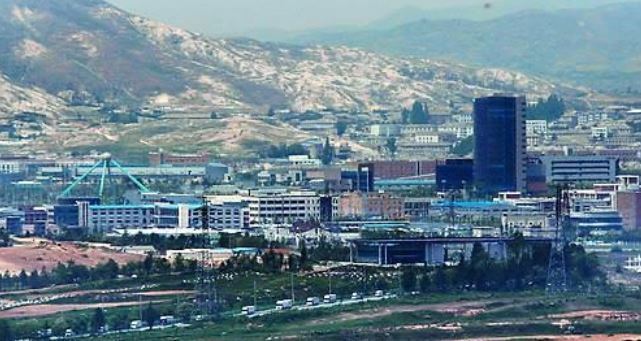 The planned establishment of an inter-Korean liaison office in the North Korean border city of Kaesong does not constitute a violation of sanctions on the communist nation, South Korea's presidential spokesman said Monday. President Moon Jae-in and North Korean leader Kim Jong-un agreed at their April 27 summit to establish a liaison office to facilitate cross-border exchanges. The two Koreas have since held talks to work out details. But a news report on Monday cited an unidentified senior US official as saying that the establishment of such a liaison office could be a violation of not only UN Security Council sanctions but also the separate sanctions that Washington unilaterally imposed on Pyongyang, because the South provides energy and other supplies for the office. Cheong Wa Dae rejected the claim. "Establishing a liaison office is a basic project aimed at easing military tensions and bringing permanent peace on the Korean Peninsula, and maintaining constant communication between the South and the North would contribute to facilitating denuclearization negotiations between the North and the US," presidential spokesman Kim Eui-kyeom told reporters. The ultimate reason for imposing sanctions on North Korea is also to advance denuclearization, Kim stressed, adding that the provision of energy and other supplies for the office is purely for the convenience of South Korean officials at the office. "This is not to provide North Korea with any economic gains," he said. Kim also said that the establishment of a liaison office was agreed upon at the April 27 summit, and that agreement was comprehensively inherited in the June 12 agreement between US President Donald Trump and the North's leader. "It's wrong to view the issue of the inter-Korean liaison office as a violation of sanctions," he said. Asked if the South and the United States are on the same page on the issue, Kim said, "As far as I know, the US has expressed an understanding." He also dismissed the news report about a US official raising concern about the liaison office as a view that some in the US might have. "We're working on the issue of opening a liaison office in close consultation with the US," Kim said, adding that the South and the North have worked out an agreement on most details of the liaison office and will soon make an announcement.